Fish is a great, easy summer meal that takes very little on-the-stove cooking time. This tilapia dish is ready in just a few minutes and combines an amazing source of protein with the crunch of fresh veggies. I use individually frozen tilapia filets and thaw two small ones in a bowl of hot water for each wrap. Just remove the fish from the plastic and submerge them in a bowl of the hottest tap water possible. You may need to change the water once, but they will be thawed in just a few minutes. Heat about a tablespoon of olive oil in a cast iron skillet while you're draining the water from the tilapia. Then season one side of the fish with your favorite seafood seasoning and place that side down in the skillet. Season the other side. As the tilapia is cooking, heat a cup of fresh broccoli slaw in the microwave. (You can find broccoli slaw by the bag in the produce department.) Then drain off as much water as you can. Flip the fish and put a whole wheat tortilla on a large plate. Heat it in the microwave for just 10 seconds. 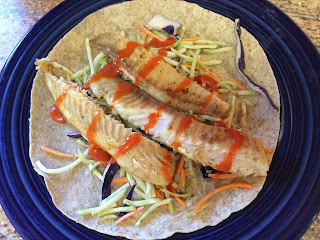 When the fish is done, spread the slaw on the tortilla and layer on the fish. Drizzle it with sriracha, soy sauce or sweet and sour sauce. 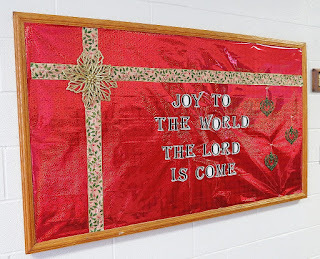 Wrap it up and enjoy!